Having just joined For.Love recently, veteran player KingJ has now made another move, this time to TongFu. At TongFu, he will be replacing yAobAi, who had also only recently joined TongFu. YAobAi’s next step is currently unknown. As for For.Love and who they replace KingJ with, we do not yet know, but rumors suggest that they’ve already got a mysterious newcomer lined up. He is a 20-something player of Dota. 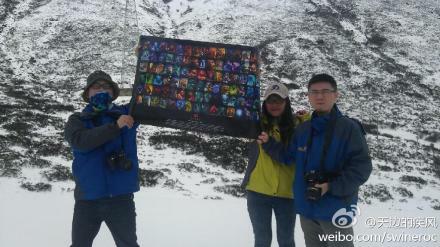 On April 12, he had posted various images from his journey, in an effort to do his part in promoting Dota 2. From his writings on the topic, he is a believer in Buddhism, and has been playing Dota for a very long time, at various points in the past having been part of the volunteer testers for DotA and Dota 2. He’s put his life’s passion and energy into Dota, and so he has an uncomparable thirst to see Dota 2 succeed in China. 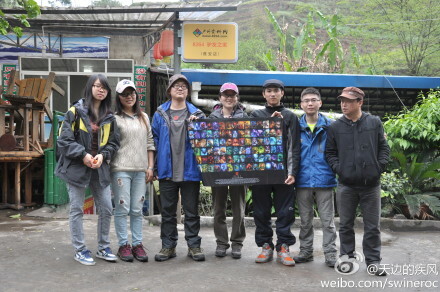 From Chengdu, to Erlang Mountain, Kangding… back and forth through the mountains he went, bringing Dota along with him. In his travels, he found joy, and he met challenges. 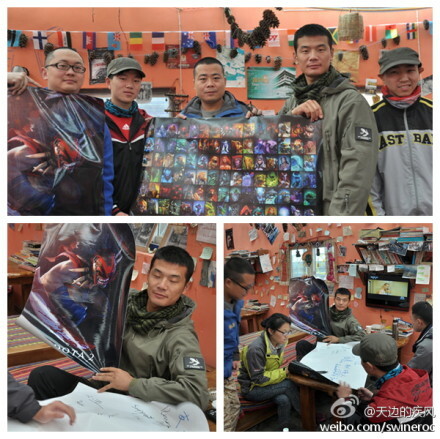 And at a guest house, he even came across other Dota fans. 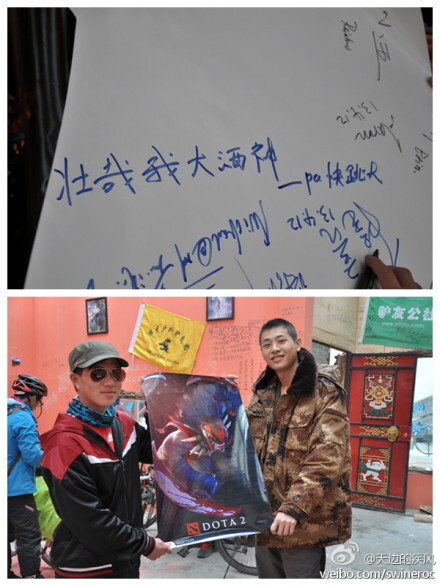 With his Dota posters in hand, he collected signatures and blessings for Dota all along the way from fellow fans and new converts alike. 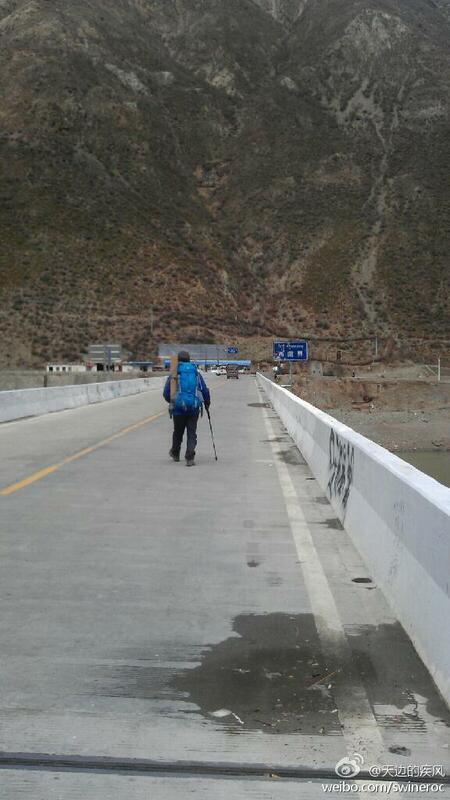 You can find him on Sina Weibo as user ‘swineroc’ — his Tibet trek is still on-going. After previous news reported that Perfect World and Gamefy had partnered up for a 1 million RMB prize Dota2 tournament later this year, we now learn that Perfect World is poised to officially announce details of the tournament later this month. According to the SGamer source, the tournament will take place during May through June of this year, with the entirety of it being held locally in Shanghai. Ten teams will be invited and compete in a round-robin points-based format, with the ten teams to be announced! The official announcement will come on Friday, April 19, at a press conference in Beijing. According to this bit, the Chinese Dota 2 beta, which had previously been rumored to be making its debut in April, will inevitably be delayed further. The source reports that, in the words of an insider with access to information on the Chinese Dota 2 beta, the development of the Chinese game client has been delayed on the developers’ side — which we speculate to mean Valve. Either way, the actual Chinese game client has seen delays, and thus, the Chinese beta has been delayed as well. Dota players in China are growing restless, however, and just how much longer this Chinese beta needs remains to be seen… But with the million RMB Perfect World tournament coming next month, it makes all the sense in the world to allow Chinese fans to watch the tournament and play the game at the same time. Let’s hope we see some real progress in the Chinese Dota 2 market soon. G-1 Interviews Roundup: xiao8, Mushi, Faith, RSnake and LGD managers, and more! Lots of interviews for G-1… check ’em all out at the G-1 portal. Previews and direct links below! G-1 Phase 3 is set to begin on March 27, with the LGD derby between their int and cn squads leading off. In anticipation, we interviewed LGD.cn’s Director 8, xiao8, to learn more about how they’ve been doing lately! Orange.Mushi: We hope to see you all in China! The groups for Phase 3 of G-1 have begun. Malaysian powerhouse Orange has been grouped with three strong Chinese teams, and it remains to be seen whether Mushi can lead his team out of the surround. Let us see here what Mushi has to share with us all. iG.Faith: Offline finals will be spectacular! Powerhouse iG finally makes their appearance at Season 5 of the G-1 Champions League. We got an interview with iG support player Faith, who shared with us some of iG’s training and talked about his thoughts on this season’s G-1. Take a look below! Pajkatt talks about life in China, his role as carry, and more! The manager sheds some light on this new team, composed of old veteran players. In this interview with LGD’s Dota manager Nic (Chinese ID: Chaorenwa), he gives us an overview of the Int squad players, what they do in their spare time, how he got where he is today, and more. Read on below to take a step into the world of LGD!